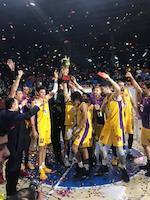 The biggest surprise took place in Shymkent where host Kazygurt (10-4) crushed league's leader Aktobe (9-5) 85-63 on Saturday evening. 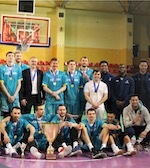 It ended at the same time the two-game winning streak of Aktobe. It was a key game for the top position in the league. Kazygurt have a solid three-game winning streak. They keep a position of league leader. Aktobe at the other side dropped to the second place with five games lost. They were replaced at the leadership position by Kazygurt. Aktobe will play next round against Tigers Ast. trying to make it back to the top of the standings. Kazygurt will try to continue on its current victory against third ranked Irtysh in Pavlodar. Very important is a road loss of third ranked Irtysh (8-6) against fifth ranked SDYUSH (4-10) on Saturday night. Visiting Irtysh was defeated by SDYUSH in Alma-Ata 89-77. Newly promoted SDYUSH maintains fifth position with 4-10 record. Irtysh lost third consecutive game. They keep the third place with six games lost. They share the position with Bars. SDYUSH will play against higher ranked Bars (#4) in Petropavlovsk in the next round and it may be quite challenging game. Irtysh will play at home against the league's leader Kazygurt and it may be a tough game between close rivals. The game in Astana was also quite interesting. Fourth ranked Bars (8-6) played at the court of 6th ranked Tigers Ast. (3-11). Bars managed to secure a 7-point victory 66-59 on Saturday. Bars moved-up to third place, which they share with Irtysh. Tigers Ast. lost fourth consecutive game. They stay at the bottom position with 11 games lost. Bars will meet at home SDYUSH (#5) in the next round. Tigers Ast. will play against the league's second-placed Aktobe and hope to secure a win.